Arab MK could not hold back a smirk as MK Feiglin said the Arabs of Israel are the world's most spoiled minority. MK Ahmed Tibi could not hold back a smirk of apparent acknowledgment as MK Moshe Feiglin accused Israel's Arab citizens of being the world's most spoiled minority. MK Feiglin replied to Tibi in a Knesset plenum discussion of the separation of Jewish and Arab groups in the Superland amusement parks. 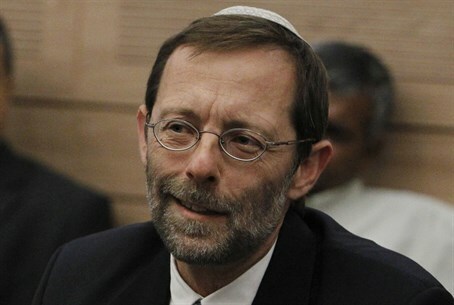 “We occasionally hear howls about racism toward the Arabs of Israel,” Feiglin said. “You know what? Here and there, it is indeed true. It happens in every divided society. It can't be denied. But I doubt that what happened in Superland falls under that category. “Had Superland decided not to allow Arabs to enter and enjoy the rides, that indeed would have been racism. But that was not the decision. The decision was to divide. And while I do not know if it was justified in this specific case, my argument is that the main reason for that is fear,” he said. “Because you are so concerned about racism," he continued sarcastically, "I would like to point to several examples of racism that I am sure you, the Arab MKs, will denounce along with me. For instance, when an Israeli citizen wants to enter the Temple Mount – if he is an Arab, he can enter freely, without being checked at all, through ten gates. All week long, almost 24 hours a day. “If he is a Jew, he may enter only during one or two hours a day, only through one gate, with an intensive security check – and MK Tibi is saying that even that is too much. Since you are so opposed to racism, I have no doubt that you, MK Freij – you will join me in opposing this racist discrimination.